To walk in the footsteps of the Buddha we need a clear and thorough guide to the essential principles of Buddhism. In What is the Dharma? Sangharakshita provides an indispensable exploration of the Buddha's teachings as found in the main Buddhist traditions. The most recent edition of this book is found in Volume 3 of The Complete Works of Sangharakshita, and is available in hardback, paperback and eBook format. To walk in the footsteps of the Buddha we need a clear and thorough guide to the essential principles of Buddhism. Whether we have just begun our journey or are a practitioner with more experience, What is the Dharma? is an indispensable exploration of the Buddha’s teachings as found in the main Buddhist traditions. 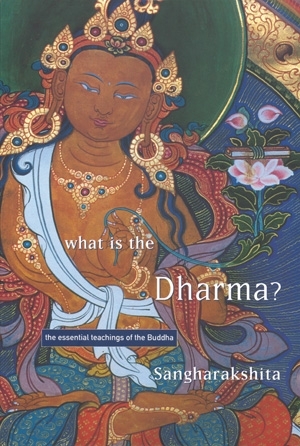 Constantly returning to the question ‘How can this help me?’ Sangharakshita examines a variety of fundamental principles, including karma and rebirth, nirvana and shunyata, conditioned co-production, impermanence, unsatisfactoriness, insubstantiality, ethics, meditation and wisdom. The result is a refreshing, unsettling and inspiring book that lays before us the essential Dharma, timeless and universal.